She had paid £5,500 for the procedure. The 48-year-old mother of two had decided that her breasts were no longer attractive after she had breastfed two babies. She was 35 years old when she underwent the procedure. However, 13 years after, she nearly died of blood poisoning when, unknown to her, the silicone in the implant started leaking into her blood stream, resulting in a range of health problems. According to her surgeons, she had suffered a ‘severe gel bleed’ and would have died if she had delayed a little bit longer. The implants and rotting tissue after they were removed. Annette Stevens, from West Sussex, had experienced a range of problems over a decade, but she said she did not suspect that they could be due to her silicone-enriched breasts. “It was after 13 years of intense agony that Annette realised that her sharp pains, sickness, heart palpitations, breathlessness and hair loss were due to her breast implants, a type which have since been banned in the UK. 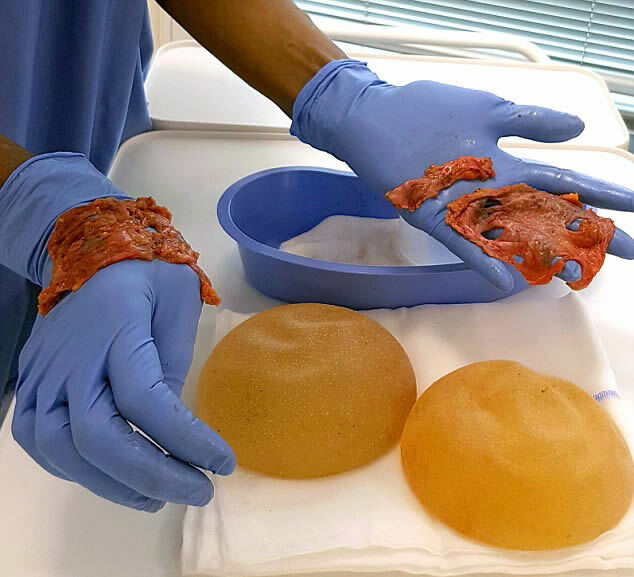 A surgeon in 2016 discovered that she was suffering a severe gel bleed, meaning the silicone from her breast implants had seeped into her bloodstream, while the tissue protecting the implants, known as capsules, were rotting inside her breast. She paid £6,000 to have the killer implants and capsules removed last October and now warns others of the potential dangers of implants. She said, “I felt like I was dying. I knew that my implants were in such a bad way that if I’d have left them any longer, they could have ruptured and killed me. “I went from a 36A to a C cup, the size wasn’t an issue for me, they were extremely deflated and needed lifting and I wanted the surgery. “But almost straightaway, I knew something wasn’t right. Along with the aches, pains and sickness, and blurred vision, I also started to put on weight. “I suffered with anxiety and depression, and my hair would often fall out, but I thought it was just my thyroid altering my hormone levels. In October 2016, she travelled to Holland to see a renowned surgeon who could remove the implants safely, spending a total of £6,000 on travel and surgery. Annette’s breasts after having her implants removed. “Thankfully, they hadn’t ruptured; but if they had been left in any longer, then the chances are they would have ruptured and could have killed me. They were deflated and the textured coating had started to break down. “I was told that my implants would last a life time and I was never told that they would need to be replaced or were dangerous. “I have been on a concoction of tablets for the past year to detoxify my body; it’s not a quick fix and I still suffer with water retention, insomnia and tiredness, which are the after-effects of the silicone in my body. “Since having them removed, I no longer worry about how my body looks, I am just so relieved and thankful to still be alive. “I just want to warn others to always be aware of the dangerous implications implants can cause,” she submitted.